Stock market investment can make you wealthy, provided you invest in best stock providing consistent returns. However, million dollar question is how to identify the best stock for investment. 70% of people make an investment based on advice given by a friend, collogue or relatives. Only 30% of people apply their mind & do the research before doing investment. This may be due to lack of knowledge or awareness. Today I will share simple idea to make a stock market investment, by using this idea many people had made a lot of money. This idea was shared by me in 2013. Follow steps are given below. (1) Find out top performing mutual funds. (3) Identify top holding of this mutual funds in specific stocks. (4) Choose stocks from different sectors. (5) Select Mix of Large cap and mid cap from this. In 2014 using a same idea, I have recommended investing in stocks like HDFC Bank, SBI, L&T, Infosys, ITC, TCS, Maruti & Axis Bank etc.These stocks have generated very good returns from 2014 to 2015. 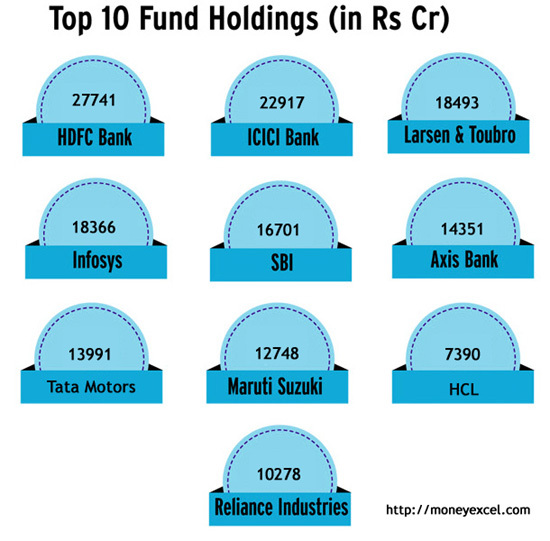 Now let us look at 10 Best stocks held by Top Mutual funds 2015. If you carefully look at the stock mentioned above, all these stocks are heavyweight blue chip stocks. These means blue chip stocks are safe for investment. Another point is 80% of stocks remain same (from 2013 onwards), means mutual fund managers also follow the strategy of long term investment. You should also follow the same strategy for stock market investment. 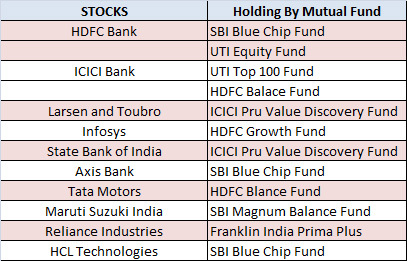 SBI Bluechip fund and UTI Equity fund is holding HDFC Bank, UTI Top 100 fund and HDFC Balanced fund is holding ICICI Bank. ICICI Pru Value Discovery fund is holding Larsen & Toubro. HDFC Growth fund is holding Infosys. SBI Magnum Balance fund is holding Maruti Suzuki. Franklin Prima Plus is holding Reliance. Believe me Invest in these best stocks or in top mutual funds now to make more money.